The “Young Heroes of America” series follows the families of three Irish brothers who in 1846 had immigrated to the United States in the years leading up to and during the American Civil War. Fifteen-year-old Mary Adams and her friend Lynn Jones are living near Philadelphia and helping in the Northern war effort, but Mary has been very sick with a fever. Her fourteen-year-old brother Thomas, their uncle Robert, their cousins Zachary, Joshua, and Ethan, and Lynn’s twin brother Daniel are all fighting for the Union. Another cousin, fifteen-year-old George Adams, is fighting for the Confederacy under Major General George E. Pickett. 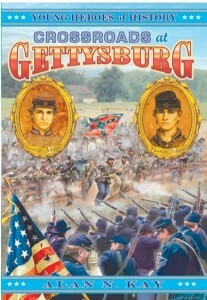 In the summer of 1863, Southern commander Robert E. Lee decides to take the war into Yankee territory, and a huge battle ensues at Gettysburg, PA. Will Thomas and George actually fight each other? And what will happen to each of them? Of course, everyone knows what happened generally at Gettysburg, but it is interesting to see how it plays out in the lives of the Adams family. Parents who are concerned about language issues will want to know that in addition to a few common euphemisms (heck, darn, crap), there are some cursing (various forms of the “d” and “h” words) and profanity (“My God” and “O Lord” used as interjections). Also, some of the descriptions of battle scenes are rather intense, especially for sensitive people.